Did you miss the vice-chancellor’s strategy dialogues? Or do you want to remind yourself of what she said? If so, you can watch the filmed version of the dialogues. Up to now, around 530 co-workers have participated in five dialogues, with one still to be carried out (on 12 March at Campus Lidingö). The dialogues are now available on film (in Swedish) for those who did not have the opportunity to take part: lisam.liu.se/strategidialog. The next step will be to collect all the replies that the dialogues have produced and analyse these. This will enable us to draw up principles on which to select areas to be given priority during the university’s normal planning. The summary from the dialogues will be published in Lisam. The three coloured rings show how we work simultaneously to follow up previous years’ plans, make plans for the current year, and set long-term plans. 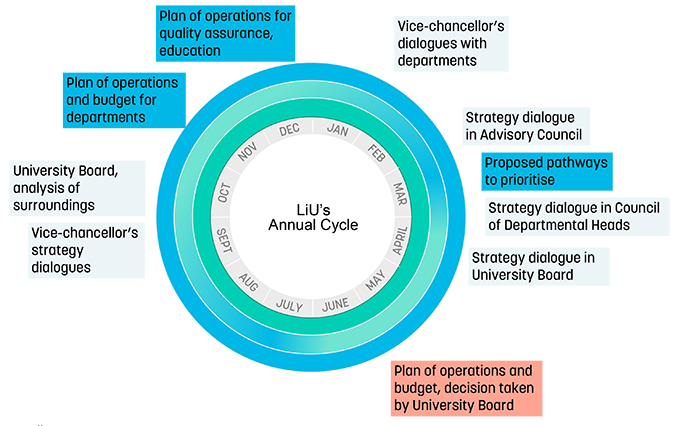 The vice-chancellor intends the dialogues to provide information about LiU’s objectives and high-priority areas, and to describe their backgrounds. They are an opportunity to find out how you and your colleagues view local and global trends, and to gather suggestions for university initiatives. Your input is important in the further planning of LiU’s operations.